Jacqueline Dohaney is a master's student at the University of British Columbia in the Volcanology and Petrology Lab studying geological science. She is a graduate of Carleton University in Ottawa, where she obtained her B.Sc. in geology, and completed an honours thesis on the petrology and isotope geochemistry of rare mid-ocean ridge basalts. 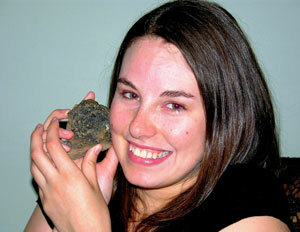 Her field of interest is volcanology and geochemistry and their applications to tectonics and mineral exploration. She has worked with several industry companies in Canada and Australia on field mapping (regional and small-scale), exploration drilling, and G.I.S. (Geographic Information System) projects. She has received many scholarships and bursaries throughout her academic career, notably the J.P. Bickell Foundation Scholarship and W.H. Collins Memorial Scholarship while at Carleton. Her current research is studying the geochemistry, distribution and petrogenesis of the Chilcotin "flood" basalts in south central British Columbia. In the future, Jacqueline would like to work on mapping and laboratory projects involving academic and industry partners. The Neogene Chilcotin Group (CG) volcanic rocks are located in south central British Columbia and cover approximately 36,500 km2 of Mesozoic and Paleozoic basement rocks. The CG volcanic rocks are un-mineralized, however the basement rocks that they cover are highly prospective for base and precious metal deposits and possibly for hydrocarbon deposits in the Nechako Basin. The nature, distribution, stratigraphy, thickness variation, age, and composition of this voluminous flood or plains basalt province are poorly known. Existing information is so antiquated as to be of little use to the mineral or hydrocarbon exploration community. The project research will be to map, collect field geophysical data, and sample the CG throughout its known extent in southern British Columbia. A GIS map will be produced from field mapping, and observations found through this study, as well as the previous work and interpretations. Geochemical investigations of the rock samples collected will provide compositional and isotopic data in order to better understand the nature and origin of these extensive basalts and will be tied into the model. The map(s) could provide a more robust decision-making tool for industry mineral exploration geologists extrapolating the regional geology; metallogeny and structure beneath these cover rocks in the search for mineral deposits because the distribution of the cover rocks will be much better known.